Float Glass has been the basic industry standard glass for framing since its invention.Recent technologies are changing that now that they are widly availabile and costs are much lower. Non-Glare Glass is regular float glass that has been etched. The etching process scatters the light, reducing its reflection. The etching can be done on either one or two sides. Usually, up to three mats or spacers can be used without the framed art being distorted. Anti-Reflective Glass is regular float glass that has been optically coated. It significantly reduces reflection or glare, and significantly increases clarity. Different manufacturer's use different coating processes and techniques. The process can be done on either one or two sides. Unlimited mats and spacers can be used without the framed art being distorted. Special handling, cleaning or cutting may be required. UV-Control Glass or more widely referred to as Conservation or Preservation Quality Glass, is a vital ingredient in Conservation and Preservation framing. (Conservation and Preservation framing are framing techniques used which will not alter or damage the art work, and aids in prolonging its life.) 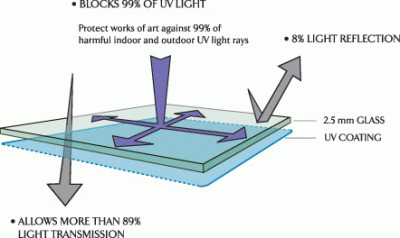 Manufacturers use various processes to create UV control glass, to qualify as Conservation or Preservation quality glass, the glass must block 97% of the most harmful UV rays. Some Conservation/Preservation glass products require special handling, cleaning and cutting. UV control is available on all our glass. Acrylic Glazing are lightweight and shatter resistant. 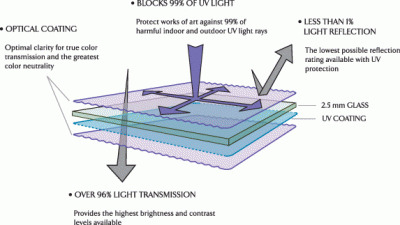 They come in Clear, Non-Glare or with a UV Protective agent in a variety of thickness'.